A Foundation Stone will shortly be laid to mark the start of construction work on Delhi’s second airport, which will be a P3 transaction. The project was announced well after the second airport for Mumbai but has caught it up, and the chances are it will open in 2022. As usual, there has been a myriad of hurdles to jump along the way, including in this instance advice from IATA not to decentralise operations. 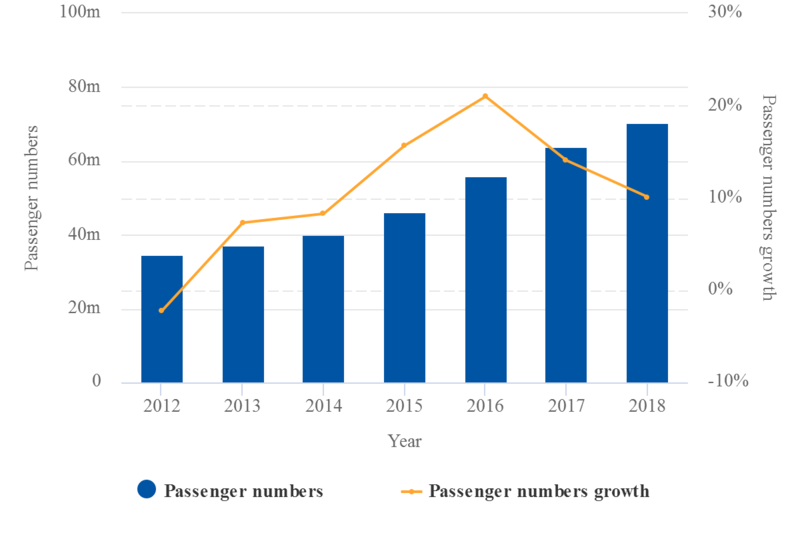 But civil aviation in India is evolving rapidly and the second airport – which itself is expected to fill up rapidly – does at least offer the authorities options to meet the demands of that evolution. Foundation Stone for the new (second) Delhi airport will be laid in late Feb-2019. The land acquisition issues that dogged the Navi Mumbai airport project appear to have been curtailed in this instance. It is a P3 project and GMR Group has 'first refusal' as the developer. Between 23- and 25-Feb-2019 the Indian Prime Minister Narendra Modi is expected to inaugurate the Jewar Noida International Airport (JNIA), a.k.a. the New Greater Delhi Airport redevelopment project, by laying a foundation stone for the (up to) USD3.1 billion project, which will be the largest airport in India by surface area. JNIA is a new airport construction project for the Indian capital, Delhi. It will provide the National Capital Region with a second facility after Delhi Indira Gandhi International Airport (DIGIA). The plans for the airport were approved by India's Aviation Ministry on 25-Jun-2015 and given in-principle government approval in Jun-2017. The Government granted site clearance to Delhi Mumbai Industrial Corridor Development Corporation (DMICDC) for the establishment of this greenfield airport. The facility required a 2200 acre site and construction is expected to take three to four years with the plan being that it will be operational in 2022/23. An alternative possibility was near Bhiwadi in Rajasthan's Alwar district but eventually the Noida site was selected, in Gautam Budh Nagar, a largely suburban district of Uttar Pradesh state which is part of the National Capital Region and 72km from DIGIA. This selection necessitated amendment of regulations preventing the establishment of a new airport within 150km of an existing facility. It was determined from the start that the project would be implemented as a public-private-partnership, for which the concessionaire would be sought through an open market competitive bidding process. That being so, the GMR Group holds first right of refusal for any new airport in Delhi and in Feb-2018 GMR Infrastructure’s director K Narayan Rao confirmed GMR plans to participate in the project. Mr Rao said that a coordination committee should be established with representatives of the Union Government, Uttar Pradesh State Government and private sector to oversee the project and avoid delays. He also called for the development of metro rail connectivity to the planned airport (see later). The development authority is the Yamuna Expressway Industrial Development Authority (YEIDA) and it is responsible for selecting the contractor to develop the airport and arranging the financing. It has already sought an INR3 billion (USD47 million) loan from India's National Capital Region Planning Board and the state-owned Housing and Urban Development Corporation. PricewaterhouseCoopers was contracted in Oct-2018 to prepare tender documents for the construction, with the aim of issuing them in Jan-2019, which did not happen. Considerable effort has gone into improving and expanding DIGIA, which is operated by Delhi International Airport Limited (which itself is owned by GMR Infrastructure [64%], Airports Authority of India [26%] and Fraport [10%]). According to the CAPA Airport Construction Database, DIGIA has undergone extensive refurbishment and expansion of its terminals in a continuing procedure that will also add dedicated charter and private terminals, rapid exit taxiways and a fourth runway within the next few years. The cost runs to USD1.8 billion through to 2025. Even so, DIGIA is struggling to keep pace with demand, as the traffic growth chart below shows. Even though growth peaked at 21% in 2016, it is anticipated that India will shortly become the third largest aviation market in the world and that even this new airport, which will be built to handle 50 million ppa, will become ‘saturated’ by 2040. Source: CAPA - Centre for Aviation and Airports Authority of India. That rather makes nonsense of a statement by IATA in Jul-2015 in which it said it was not in favour of the proposal to develop a second airport in New Delhi until the existing airport reached saturation. The reasoning was that having a single airport would grow Delhi as an aviation hub as it would make it convenient for passengers making flight connections. Airlines could focus all their resource in one location, and there would be greater efficiencies in not having to duplicate services. 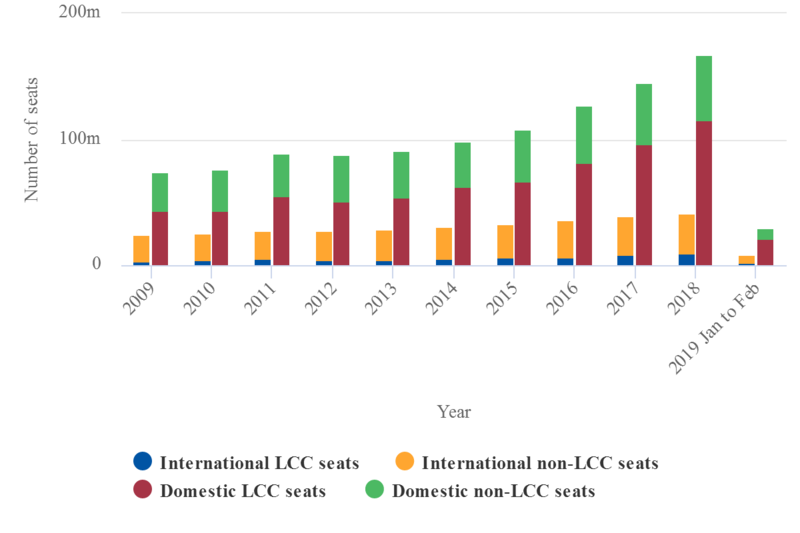 However, that statement appeared to overlook the burgeoning enlargement of the low cost segment in India, which has grown to 26% of total seats on international flights and 72.4% of seats on domestic services in Jan and Feb-2019, along with the self-connectivity that goes with it. (At Delhi, the low cost impact is not that high, namely 11.2% and 56.6% respectively, but then it is the capital). A metro rail line was mentioned earlier. The Delhi Metro Rail Corporation (DMRC) has said that it will submit a feasibility study report for the development of a rail line connecting the new airport to both Delhi and Greater Noida in Feb-2019. The proposed line includes provision for express rail connectivity with limited stops between Delhi and Jewar and metro service connectivity between Greater Noida and Jewar. The laying of a foundation stone always indicates at least that the planning stage is over and that construction work can begin. The appropriate city and regional authorities will be congratulating themselves that they have narrowed the gap on the Navi (New) Mumbai Airport, which will fulfil a similar role in that city. Its construction is under way, but it was first proposed long before the new Delhi Airport and it was originally scheduled to open in 2014. The Delhi project seems to have avoided some of the pitfalls that befell Navi Mumbai.